There are four, all-weather, 3m x 3m gazebos available for use by Crediton community organisations. 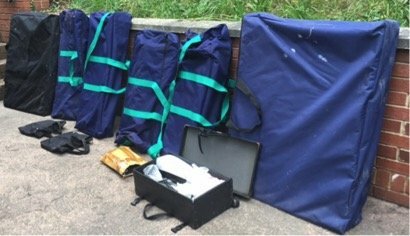 Each gazebo is packed in two canvas bags, one containing the walls. They are reasonably easy to put up but this is best done with four people. They also come with sandbags for weighting down. 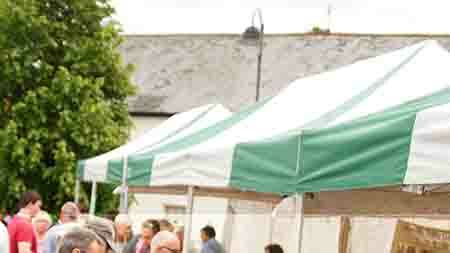 If you wish to use a gazebo for your event please email info@creditonfoodfestival.co.uk for further information. 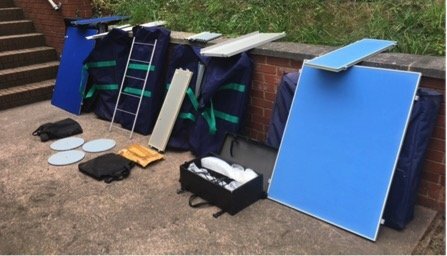 As a result of a kind donation, the Town Team has a set of exhibition boards for use by the community. A set of 6 x A1 double sided exhibition boards (dark blue/grey) + 3 matching header boards. These boards have larger connectors. A set of 8 x A1 double sided exhibition boards (light blue/grey) + 8 header boards to match. 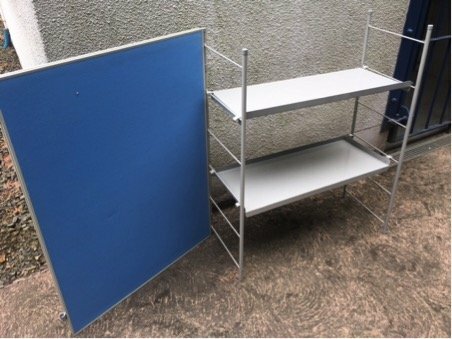 11 metal shelves and 8 shelf supports plus a set of poles to connect the magazine racks to the exhibition boards. These boards and rack supports have smaller connectors (the two sets of connectors are not interchangeable). There are also 8 circular floor weights, but we don’t know how they connect with the board. 4 X anglepoise halogen spot lights with clips, with spare bulbs and a circuit testing screwdriver. To hire the boards, please contact Kate Lock 07866 697303. They are stored at the Town Council lock-up on Lords Meadow Industrial Estate. The key can be obtained, once agreed with the Town Team, from the Town Council. There is no charge at the moment, but please make a generous donation to the charity of choice of the person who donated them, Balloons, which supports bereaved children and their families. Donations can be made online at http://balloonscharity.co.uk or by sending a cheque, payable to ‘Balloons’ , to Jo Overton Pitts, at ‘Balloons’, Basepoint, Yeoford Way, Marsh Barton, EX2 8LB.